FOR DETAILED LOCATION/EVENT/PARKING INFO SCROLL DOWN TO BOTTOM OF PAGE! Whilst the focus of the weekend is Social Dancing, we also have 3 great workshops. You don't need a partner to book we will aim to be gender balanced. PRE BOOKING ENDED. YOU CAN PAY ON DOOR FOR ANY MILONGA OR WORKSHOP. All the Milongas have a little free fuel included to keep you going. These are simple light refreshments plus teas and coffees. However, you will need to supplement this throughout the weekend. Within 5 minutes walk: Hove Centre with 30-40 restaurants, bars and cafes. Directly Opposite: Tesco Metro across the road from Ralli Hall. Plenty of sandwiches, cakes, fruits etc. Please remember that due to it's religious nature, no meat or shellfish can be brought into Ralli Hall. During Brightangothon we will also be running run another popular Beginners BootCamp in a different venue (half day, 1 day or 2 days). This is our original product and thousands of people have started their tango journey at one of our beginners bootcamps. There are plenty of hotels/b+b's within a few miles of the venue. Brighton is busy year round and hotel prices reflect the high demand. There are a number of options ranging from £20 for just a bed to crash (www.hostelworld.co.uk ) to at least 10 different £50 b+b with private room just a short walk away (https://www.airbnb.co.uk/ search Hove). 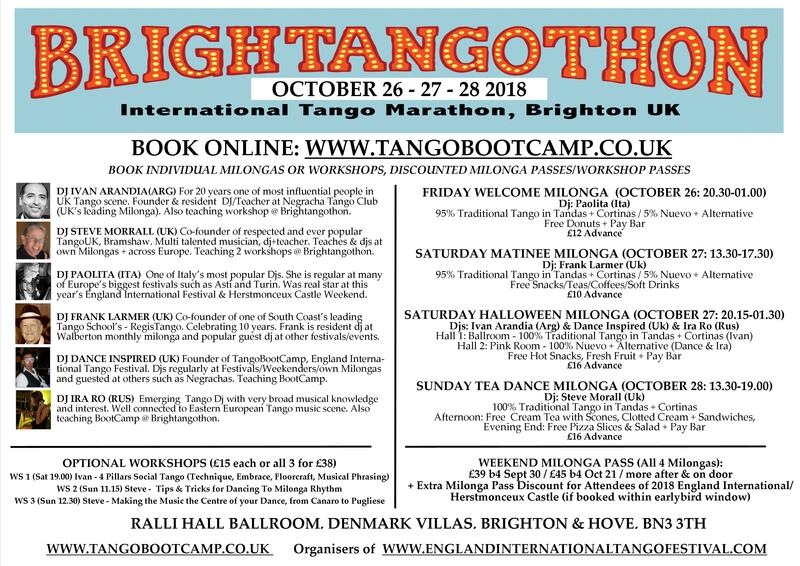 All Brightangothon Milongas and Workshops will be held at Ralli Hall in Hove. It is directly opposite Hove Train Station which is 1 hour train direct from London and also just a few stops from Gatwick Airport. Hove Station also has a Pay/display car park.